The Holiday Inn Express & Suites Aurora - Naperville, managed by Midwest Management Inc., draws leisure and business travelers from across the globe to the Aurora - Naperville area. The company underwent a brand transition and renovation that included new decor and updated amenities. J Rudny was contracted by Midwest Management Inc. to manage their brand transition and create a new website that is fully responsive and reflected the brand during each phase of the transition. In 6 months, the website transitioned from a Comfort Suites Aurora to the Broadway Hotel, and eventually to the Holiday Inn Express & Suites Aurora - Naperville. This project consisted of several major objectives to transition the website to a new hotel brand in a short amount of time, while utilizing our CMS to handle the new design and convert the site to coincide with the official launches of each brand. Transition the website to three different brands in 6 months. Utilize redirects from old site to time transitions correctly. 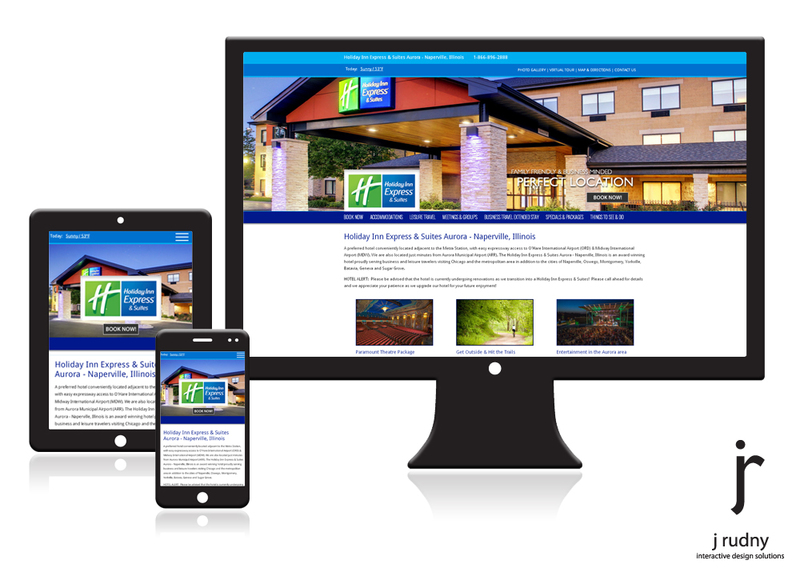 Our solution was to provide the Holiday Inn Express & Suites Aurora with a fresh and fully responsive design for desktop, tablet and mobile devices. In addition, we utilized our fully-featured content management system to manage the transition of the three websites to coincide with the launch date of each new brand. Finally, we implemented search engine optimization tasks to aid in the proper indexing of each new version of the website. Custom Content Management System (CMS) to manage the transition of each site. Implement search engine optimization (SEO) tasks to ensure proper indexing. Creative content development throughout the final website. Complete training for staff on the new content management system (CMS). "We have been using J Rudny design for as long as we have had websites. From state-of-the-art redesigns, multi-screen designs, SEO consultation, you name it, J Rudny has helped us navigate the waters of tourism website design. Their designs are relevant, fresh and inviting. Trying to get your hotel to stand out in a sea of hotels is a challenge. J Rudny has helped us to do this quite effectively," said Rocky Pintozzi, President & Owner of Midwest Management, Inc.